Vivix Shaklee's Resveratrol Anti Aging Product has been tested, proven, documented, and research published for it's anti aging benefits. Research is currently being completed of other health benefits. When the results are documented and published peer review scientific journals I'll be sharing more testimonies to the public. In the mean time if you want to hear more detail of results happening you will have to give me a call (Call Cindy @ 888-272-6701) and I'll give you access to a password protected site. This on just in from Kathy. Ok, here is the scoop---yearly visit to my opthamologist. She was at our presentation a year ago and heard what we were saying about Vivix. She said she was skeptical but knew the benefits of resveratrol. After the exam she was amazed, could not believe it, my eyesight had improved by 50%!!!!! A year ago I was at a -2.00, this year I am -1.00! I told her it was the Vivix----the only thing different this year. She went on saying that I looked so healthy, my skin was smooth and tight and my hair had so much shine. In other words she could not say enough good! I will now continue to work with her to educate and promote Vivix! This next one is a pretty BIG anti aging benefit. I don't know about you but when I heard this testimony and thought about what anti-aging really could mean for the health of another person as a preventive chills went up my spine. Written by (me) Cindy McAsey..
Tom Prendergast CEO of Veretekk, is a business associate I've been working with for over 5 years. He has never been very open to Shaklee until his girl friend, Annette (another business assoc. of mine) started using Shaklee Products. Annette experienced the "Shaklee Difference" and became a faithful user of the products and wanted those close to her to have benefits only folks who use and love Shaklee experience. Annette purchased Vivix for Tom's Birthday. She knew he was having some health challenges and knew if she was successful in getting him to take Vivix he might start experiencing the "Shaklee Difference" too. I'm happy to say Annette had enough influence on Tom to faithfully take Vivix. Annette and I started hearing Tom talk about vivid dreams he was having not long after starting on Vivix. This didn't suprise me since I experienced the same thing when I started taking Vivix. What did suprise me was when Tom mentioned how he had been struggling with a white spot on his tongue. Tom shared how he has smoked cigars for several years on and off. He said he had experienced this white spot on his tongue before but when he would quit smoking it would go away. Six months ago his dentist had told him the white spot was T-Cells. (pre-cancerous) Immediately Tom had quit smoking, but this time the white spot didn't go away. No one but Tom and his dentist knew about the white spot. Tom had been taking other health supplements, but it wasn't until 3 weeks after taking Vivix the white spot began to disappear. It's now been 6 weeks and the white spot on his tongue has completely disappeared and the thickening of the area (he explained it like a scar on his tongue) is almost gone. 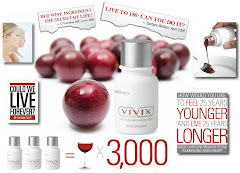 Vivix Shaklee's Resveratrol Anti Aging Product protects and repairs the DNA of the cell. Until more testing and documented research is published the general public won't have access to all testimonies of faithful Shaklee product users unless they call and get access to the password protected area.